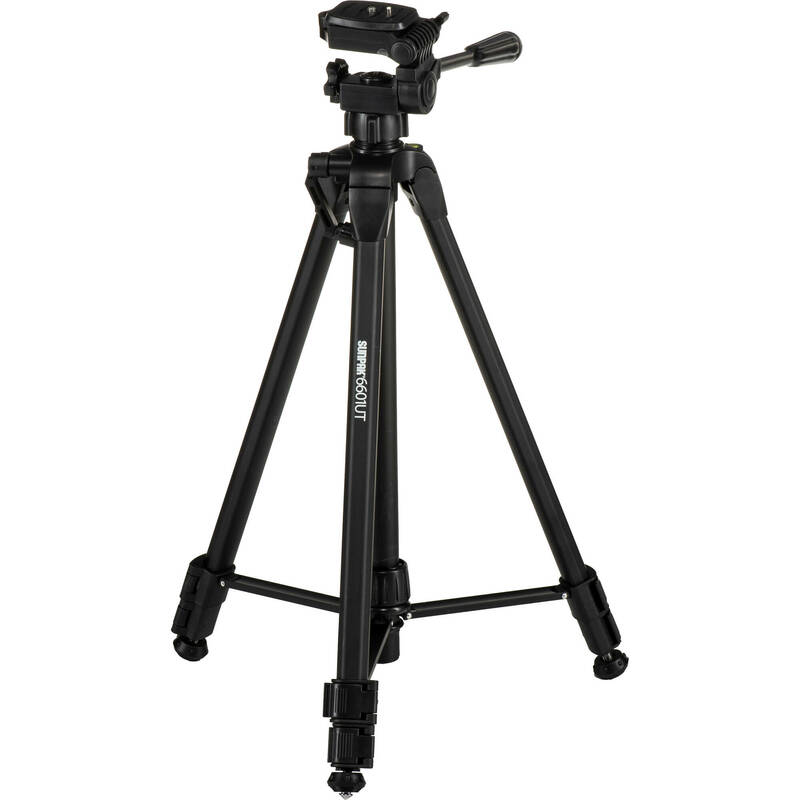 This Sunpak 6601UT Tripod supports up to 8.0 lb, measures 22.5" when folded, and includes a three-way, pan-and-tilt head. Its 3-section legs each feature flip locks for fast deployment, and can be positioned for a minimum height of 23.8" to a maximum height of 46.8", or 59.0" with its column fully raised. The column utilizes a geared movement for precise height adjustments and an integrated center brace allows the legs to be spread simultaneously as well as uniformly. The center brace helps to hold the legs in place, which include rubber feet with twist-out, metal spikes to further enhance stability on a wide variety of surfaces, including soft and uneven soil. Cameras, sport optics, or camcorders that are compatible with a 1/4"-20 mount can be connected to the quick release plate which is secured to the tripod's pan-and-tilt head using a quick release cam lock. The head can be rotated 360°, and tilted 90° backwards or forwards, as well as sideways for portrait orientation. Each of these three movements function independently of each other and can be locked into place. Box Dimensions (LxWxH) 24.0 x 5.0 x 5.0"
6601UT Tripod with 3-Way, Pan-and-Tilt Head is rated 4.3 out of 5 by 125. Rated 2 out of 5 by John J. M. from Material Concerns I've bought several Sunpaks over the years. With some metal and a good deal of plastic, they don't last forever. They are inexpensive, and light to carry. Weight can be an issue; I have had the wind blow a tripod over. This most recent Sunpak, seems a bit flimsy. The plastic portions of it seem like they may be more brittle than in the past, so plastic fatigue will be a concern. I keep the tripod in my trunk, ready for use, so perhaps extremes of hot and cold will take their toll. I've only used it three or four times, and it's been adequate. Prior models felt more solid, and I've cannibalized parts of two old ones to use as a back up to this model. You get what you pay for. Rated 4 out of 5 by Annalee from Happy Buyer Using these for off-camera flashes. They are pretty great for what they cost. They are not meant to be man-handled but will work well for my purpose. These were an alternative to the Slik tripods which were more expensive. Basically, I got 2 Sunpak tripods for the price of 1 Slik. I even modified them to hold an umbrella with the neat trick I learned from Scott Hargis...very cool. See attached pic. All you need is 2 eyebolts and a drill....so much less to deal with. Rated 1 out of 5 by Anonymous from Don't Waste Your Money I teach television production in a high school setting. Don't waste your money on these tripods. They are lasting max 2 months in my class before breaking. One of the biggest issues is the center breaks and the tripod legs can no longer close. The brackets also have been breaking on them. Rated 4 out of 5 by Anonymous from Inexpensive and lightweight This is my first tripod. It's nice and light which makes it easy to carry around. I haven't had it very long, but the adjustment for spreading the legs out is getting a bit grabby and difficult already. It's also not as sturdy as other more expensive models, but I expected that. I would recommend it to friends who are saving for a sturdier tripod as I intended when I purchased this tripod. It will later be used to hold off camera flashes, and the like. Rated 1 out of 5 by seuss from very poor material quality on the plus side they're compact and light and cheap. on the minus side the components snap if you breath on them too heavy. very low grade, fragile plastic. i bought three for a project. they started breaking on first use. to their credit sunpak replaced. but the replacement snapped almost immediately too. it's problematic when you can't tighten a tripod down so it doesn't move. defeats the purpose. pretty much useless for anything but the lightest of light duty. and even then, make sure you handle with kid gloves. in fact, save yourself the headache and just avoid it. there are much better options out there. Rated 5 out of 5 by sampleboy from Solid performer at a bargain price Thanks to B&H this tripod arrived just in time for my Hawaii trip. Very compact and fit perfectly on my Lowepro 102AW tripod holder. Not as lightweight as those flimsy $10 but at 2.88 lbs it wasn't an avil either. I was able to carry it on my Lowepro for an entire day walking the streets and around Int'l Marketplace. I love the quick release plate that is included which let me mount the camera in seconds. Very quick and easy to extend and compress. We also used it on the beach during a windy day and it was stable as a rock. Highly recommended for the price! I was about to buy a cheapo $15 tripod but figured I'd spend the extra $10 for a better build quality and feature-packed one. Rated 5 out of 5 by ReserveReverse from Killer tripod for the price I use the product mostly for indoor photos and landscape photos outside. It's light and feels durable, the controls are intuitive. It's simple. It's great. I can see how it might be heavy/bulky for long hikes, but I much prefer the weight and balance of the tripod to my camera bag. :) I'd definitely suggest this as a first tripod or a standard tripod. Some users might find it a little short. I'm 6'1 and have to stoop a little uncomfortably to use the view finder at the tripods highest setting. That being said, I'm happy with the purchase price and it's a fantastic tripod for the dough! Rated 1 out of 5 by George D. from Sunpak SU6601UT tripod FAIL This unit is a bad implementation of a good idea. The center post will actually flex when fully extended. The legs are wobbly when fully extended. The bubble level is barely visible when SLR attached - almost useless. If it wasn't for the low price I got it at I would have returned. This will be my car trunk tripod - there for when I forget to bring along a good one. This tripod is a good example of building a product in the cheapest possible way. If the manufacturer had just ribbed the leg sections it would have been much more stable. Legs and center post mode a material that is too thin. I have used this and find it best to keep the lower leg sections closed, and the center column only extended to half length.